Yeah, me too! Subtle, but striking, if that makes sense? Her tail pattern is almost grayish purple and her tongue is blackish blue. LOVE her eyes (gray and blue) and her temperament. We basically asked the breeder what his tamest snake (BCI) was. He sent us pictures of three snakes. We liked her the best. There was a hypo male who looked pretty cool too. But, we are incredibly happy with Behira. Was also considering a Sunglow or Sunglow Motley, but already having an Albino Spider BP, wanted something a little different. 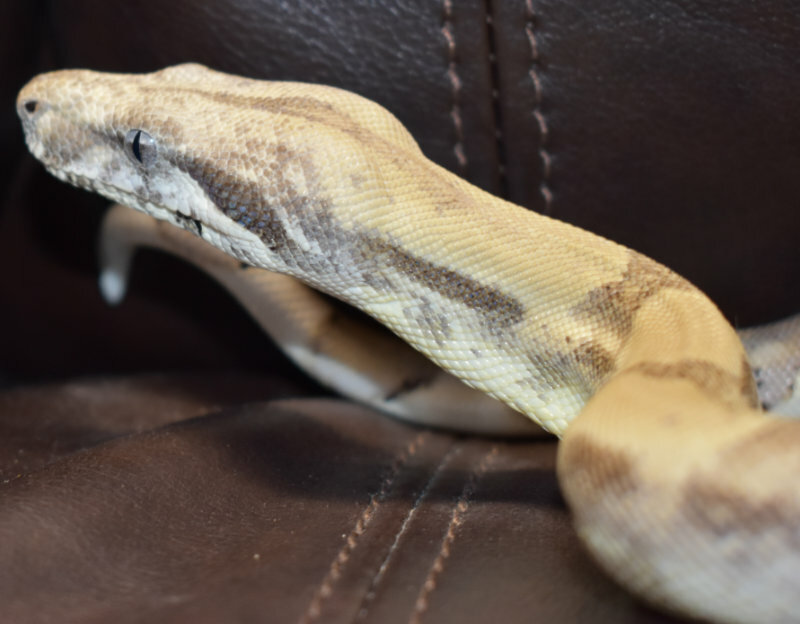 For those who are curious, Behira is a Ivory Ghost, 66% Het Moonglow. So, she is Hypo Anery. As indicated in this thread, she has light and dark phases, as do all BCI's. Her head can almost jet black or totally tan and her body can be dark tan to light tan. Last edited by dakski; 02-10-2018 at 10:46 PM. One picture Katie took of me and Behira. She doesn't seem so small until I see a picture of me holding her compared to adult female BCI's! Anyway, love her to death (both Katie and Behira) and can't wait to see her grow (Behira). She is only 1 1/2 or so and about 700G. BCI's grow slow, so it will be a while, but it's all good. Healthy snake over rushing her growth! Okay, probably overdoing the new camera thing, but with such pretty animals, and Behira being such a gorgeous young lady, who could resist? Thought I'd post in Behira's thread, a thread I started yesterday regarding how big Behira will get! Seemed appropriate to put here as well. Thank you everyone for the thanks and support with Behira. She is my first BCI and I adore her, but also want to make sure I am continuing to do the correct things for her. I want a happy and healthy snake for a long time! I will continue to update as she grows, although maybe not so often! I still have new snake fever! 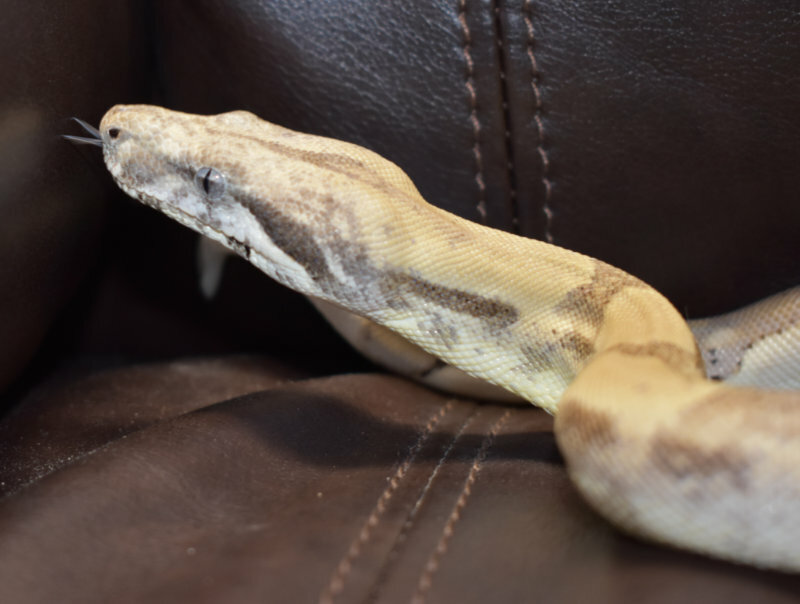 Several months ago when I got my 1st BP, I had no interests in a BOA but I've gotten the itch pretty bad these last couple of weeks looking at your threads and the rest of the boa owners. I would never pull the trigger w/o a massive amount of research but Behira is stunning! I'll admit, I've been looking at Hog Island Boas but she his stunning. It seems like Boas are a little bit more social and better eaters then BPs which is very appealing right now. Congrats on a great find! Thank you, I think Behira is stunning as well! Great contrast of coloration and markings on her, and her eyes are beautiful! Yes, BCI's (what most morphs are - but always check - BCC's need more humidity and grow slower but get bigger) will devour any food put in front of them, pretty much. Behira is more like my corn snake in terms of food response than my BP, for sure. The problem with Boa's is NOT overfeeding. It can be really bad for their health. Behira is 1 1/2 (roughly - June 16 baby), and I am already feeding small rats (but smaller than she can eat - 60G or so when she could eat 80G) every other week. She would happily eat weekly or more, but I do not want health issues later. Smaller meal every two weeks. Basically, the bigger the snake and the bigger the prey item, the longer between feedings. Adult BCI's can eat large/jumbo/colossal rats every 3-4 weeks (again depending on size of boa and prey relative to boa). Their metabolism is SLOW! A strong feeding response is awesome compared to a BP who, as you know, can fast or refuse food. I don't think you really need to worry about that with BCI's. However, long hemostats/tongs and being careful is a must! 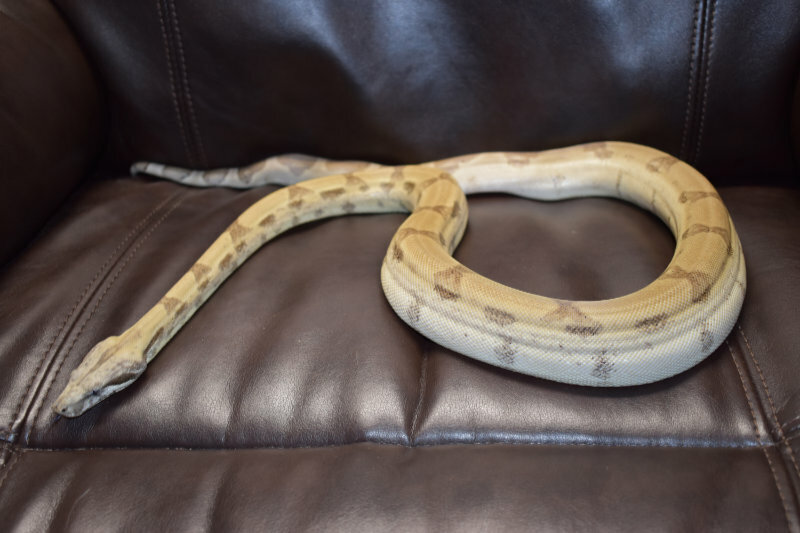 There are some amazing morphs of BCI's and many are not super expensive. Behira was about $500. However, there are many beautiful morphs for that or less. I love the Hypos as well, and they are closer to $200-300 or so, from what I have seen (from the same breeder I got Behira from and I like very much). I am partial to Sunglows as well, but already having an Albino BP, went in another direction. However, moving from a BP up to a BCI you have to consider a lot. 1. Experience level - BCI's in particular are generally puppy dog tame, but they do get BIG, females in particular. I asked the breeder for the tamest BCI he had, male or female, and Behira was one of 3 finalists. We loved her coloration and markings and her eyes! A tame young BCI will likely be a tame adult with proper handling, husbandry, etc. They can be nippy when young, as can BP's, but tend to grow out of it. I think richardhind1972 has a BCI, Medusa, that took a while to calm down, LOL. However, I think that is rarer than it is common. 2. Costs and ability to provide for: Food, heating, proper sized enclosure (BIG - especially if you have a female) that can maintain heat AND humidity, etc. 3. Place in life and where you live and if you own, rent, or plan to move soon. Moving a 4FT BP isn't a huge deal and I imagine most landlords don't mind. However, a 7-8FT female BCI, in a 6 foot enclosure, that's asking a lot and is a big commitment. 4. Spouse, partner, future partner, etc. It took Katie a while to get used to the reptiles and I do not think she is thrilled about how big Behira will be. Could you imagine her coming to my house, or hearing that I had a BIG snake, before she was comfortable with even Figment (my corn) or Shayna my BP. Not trying to preach, but I thought about all this when I got Behira. 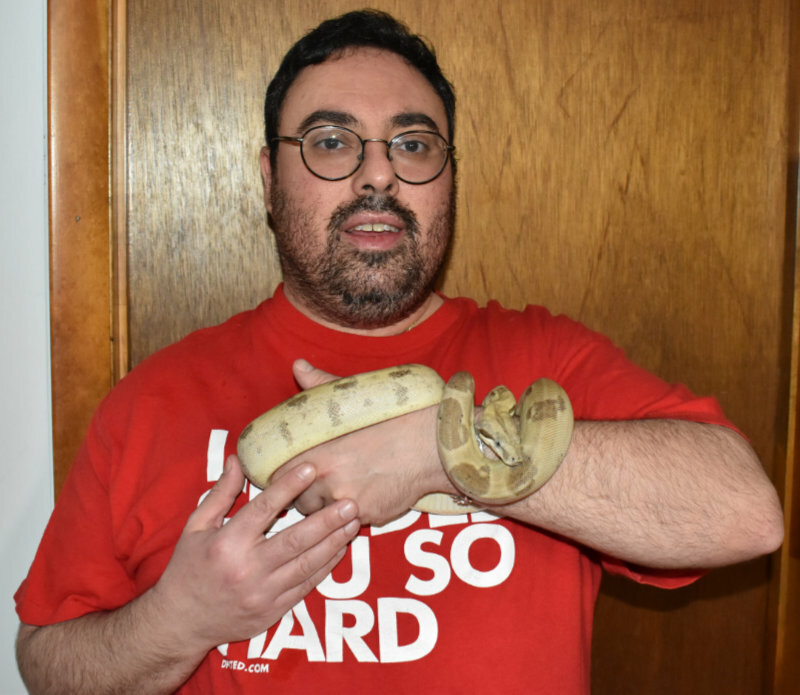 It is definitely a bigger commitment getting a large snake as opposed to a smaller one. I just want anyone considering a BCI to know what they should think about. Having said that, I think she is one the coolest animals I have ever had. She is calm, but inquisitive, and more active when being held than most BP's, but without being daunting when she is big. I really like her personality. Male BCI's are usually 4-6FT, maybe a little bigger, and have much less girth. They are probably a better foray into BCI's, as are some dwarf species (although I cannot speak to temperament or requirements for those), than doing what I did and get a female BCI as my first big snake! Again, not trying to turn anyone off, and I truly love Behira. However, it was a big decision for me. Now, I am committed. Katie is too . Thank you Ckuhn003; I really appreciate the compliment(s) and I am glad this thread is helpful to you! Also really touched that you find my posts informative! A male makes a lot of sense, especially if you are stacking T10's. Those are 4'X2' and 15 inches high, correct? I would say that would be great for a BP, if not a little bigger than necessary (of course I have a BP in a 6X2' and it works great, so not judging at all). It would probably be just right for a male BCI up to 6FT or so (which, if fed properly, and check with the breeder that the parents are not huge, etc. ), which is very reasonable. I personally think a T10 is too small for an adult female BCI, but others' may chime in and say it's ok. I get convincing your wife though. For what it is worth, I told Katie we should get a male and that it wouldn't be much larger than Shayna. She was not in favor of getting another animal, period, certainly not a big snake. So, I "compromised," and said what about a male BCI? She said, "okay," reluctantly. Then we saw the pictures of what the breeder we particularly liked had. She really liked Behira as she had the best temperament to feeding response ratio, and was totally tame. She really liked Behira. I said, "are you sure"? "Females get a lot bigger." She said, "do what you want." I pick my battles, but give Katie a lot of credit here for going along with me on this particular ride. She was especially not happy a couple weeks ago when I got that feeding response bite. She did pull the, "I said I didn't want another animal," card, but as noted in my thread on the bite, was happily holding Behira again within a week. She also apologized for using that card and heard me out, and let me explain hook training, etc. In any event, I would definitely go to some shows like you say, and hold some BCI's and see different morphs. First, BCI's feel different than BP's in terms of skin feel, the way they move, and strength. They are deceivingly strong. At 3+ FT I think Behira is as strong as Shayna at 4FT (and 2X the weight), or at least flexes her muscles more . I had never held a BCI before meeting Behira's breeder at a show. I did a lot of research after, and worked with him to make an informed decision. However, I never really paid attention to how big they got until after I thought about and had Behira. Probably a good idea to check out some adults, if possible. At least look at some pictures or videos online. They are more snake than a BP for sure! I would hate for your wife to regret the decision in 5 years! I have that fear with Katie a little, but she is watching her grow, and I think it will be fine. I really didn't even realize how big 6X2' tanks are until I got mine and set them up! Right now Behira looks so small in there, but not forever! I also know very few, if any reptile, people. I rely on breeders, this site, reading a ton, a little trial and error, youtube, etc. I take most of youtube and some of what I read with a grain of salt though. Many more people seem to rely on me to answer reptile questions than the other way around. However, I am still not afraid to ask questions! Keep asking questions and exploring your interests! Good luck and let me know if I can be of any more help.